Nothing beats a good brush when it comes to cleaning. Yup! Whether you are cleaning a hard surface, you are cleaning your teeth or your face, brushing can eliminate most of the dirt. I grew up using a soft brush every time I washed my face, so brushing the skin is not new to me. I was recently given the opportunity to review the World's first Antimicrobial Sonic Skin Cleansing System. Here are some of the important things you should know about the product. 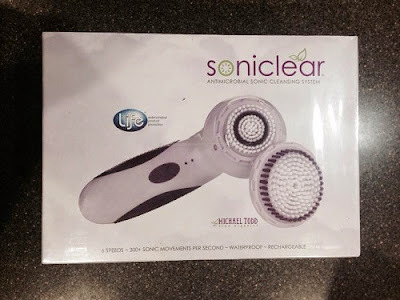 Introducing SONICLEAR, the World's First Antimicrobial Sonic Skin Cleansing System because cleaner skin begins with a cleaner brush.™ Powerful, yet gentle enough even for sensitive skin, Soniclear micro-massages away dirt and impurities and then protects itself from microbial contamination. Removes makeup 6x better and cleanses 2x better than with hands alone. Fans of sonic technology range from Lady Gaga to Oprah. 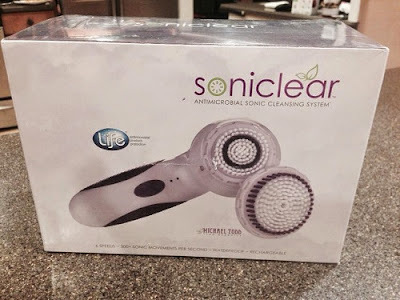 So for improved skin tone, reduced breakouts, better absorption of skincare products and overall better cleansing, meet SONICLEAR ~ your new favorite skin cleansing tool. I used a gentle facial cleanser with the the brush. I placed a small amount on the brush and wet it with water, then placed it on the skin and I gently moved it in small circular motions. It felt really great because it's like gently massaging your face. The brush has different levels of sonic speed and each speed addresses a person's specific skin concern. • 4th speed ~ Bottom red light on. This speed is intended for compromised or fragile skin, and is delicate enough for sensitive skin conditions. Use once a day or every other day to condition and improve skin without drying or irritation. • 5th speed ~ Top red light on. This speed is intended for normal skin types and cleansing six times better than hands alone. Use daily once or twice a day. • Top speed ~ Both red lights on. Use the Top speed when extra power is needed to loosen and remove dirt and debris. • With the body Brush Head attached, there is a three minute cleansing cycle with a beep each 60 seconds. After three minutes the unit automatically shuts off. When the Body Brush Head is attached, soniclear Handle automatically switches to the Body Mode, with a three-minute cycle. Pressing the speed button while in Body Mode toggles between the 3 body speeds from sensitive skin cleansing to extra cleansing power to loosen and remove dirt and debris. My skin felt very soft and clean after using the brush. Even though I am in my forties, I still get a dose of acne from time to time, but ever since I used the brush to clean my face, it's clearer, glowing, and I noticed that my pores are smaller. I also used the bigger brush for my body and just like with my face, my skin felt soft and glowing. So far, I am enjoying the Soniclear brush a lot. My skin looks more radiant and I haven't had a breakout since I started using it. This will definitely be an addition to my skincare routine and I'm sure I will continue more improvements in the weeks to come. If you're wondering where you can purchase the brush, you can get it through the Soniclear website or on Amazon. It's fairly priced at $150.00. I've seen similar brushes that are more expensive and they don't have the amazing features this Soniclear from Michael Todd brush has. And because you are a loyal reader of this blog, you get 20% off when you purchase the brush. Hurry because the brush sells fast.